Exclusive Emmy limited collection in the Netherlands only at TopVintage available! 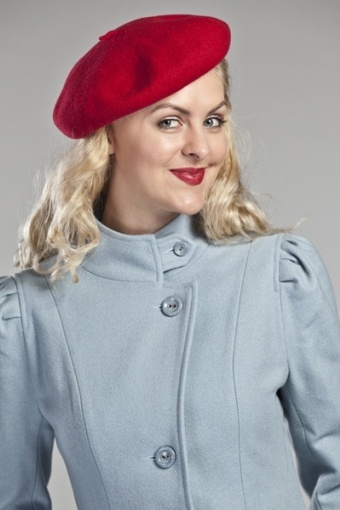 The 40s Girly Swirlie swing coat sky blue wool. This fantastic vintage inspired coat is perfect over your flouncy skirts and dresses, or just with skinny pants and a pair of high heel boots! We were inspired by a vintage 40’s coat but added a 60’s swing skirt to create a younger and cheekier look! The shaped bodice and full swing skirt mark the waist which enhances your womanly shape. The bodice has many vertical cuts to create the best possible fit. Decoration buttons at a strap detail around the waist. It has concealed side pockets, puffy pleated shoulders and a dress collar that can be closed for maximum warmth. Made of high quality 100% wool in cool iceblue/greyish colour with a perfect finish and produced in Europe. This timeless coat is a fabulous addition to your wardrobe and an investment that will last for years! Also available in Black, Emerald Green and Red.